Sybil Hoffman investigated one valley school that turned a blind eye to ongoing bullying. Hear from the parents and the boy who now has the scars to show for the school's refusal to take any action to protect him. KGK's Hope Kirsch will be one of the presenters and panelists of this Maricopa County Bar Assocation sponsored CLE for attorneys and judges who have cases involving children with autism. Thursday, November 1, 2012; 1.5 CLE credits. 3TV Special on Seclusion in Arizona Public Schools. Sybil Hoffman reports. In a special report, tonight, 3TV investigates what Arizona is doing -- or rather, NOT doing -- to address the dangers of restraint and seclusion in our public and charter schools. Tonight, at 9 PM on 3TV. Sybil Hoffman went behind the scenes, uncovering the failings of our legislature and the schools to protect our children. They say it gets better...and it does, but there are always exceptions to the rule. Today's New York Times story on ADD and some doctors' thoughts about drugs, is creating buzz and discussion. Free training for parents and teachers on practical information that leads to the reduction of the use of restraint and seclusion and/or removal of a student with challenging behavior from the education environment. 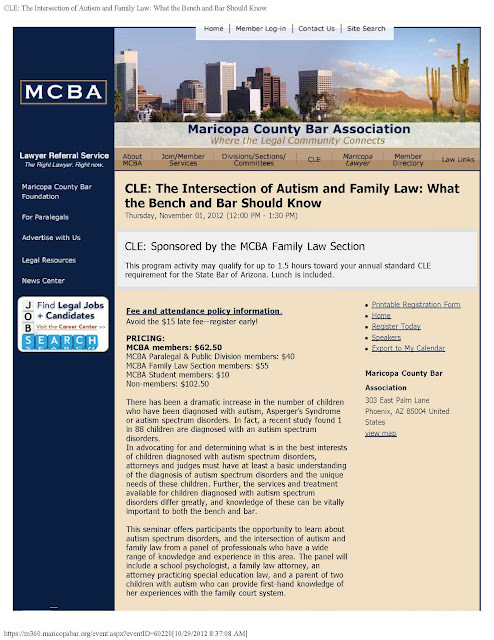 To register via phone or email, please contact the Center at (602) 274-6287 (voice/TTY) 1-800-927-2260 (toll free) or e-mail kvanhorne@azdisabilitylaw.org. Presented by the Arizona Center for Disability Law & Institute for Human Development - Northern Arizona University. For more information, visit www.azdisabilitylaw.org, www.nau.edu/ihd and www.azdes.gov/ADDPC/Home. The New York Times' economic columnist Ron Lieber, looks at financial ways to assure the care of a special needs family member are met. A new study published in the American Journal of Psychiatry says the original figure of 45% of children not being diagnosed as being on the autism spectrum under the new proposed guidelines, says that figure is closer to 10%. This study gives parents a little more comfort in knowing the system has been modified to allow more help for their children. Today's New York Times reports on the issue.